As with any series that has been influential and is permeating the pop culture subconscious, studios wanted to turn Speed Racer into a feature film. 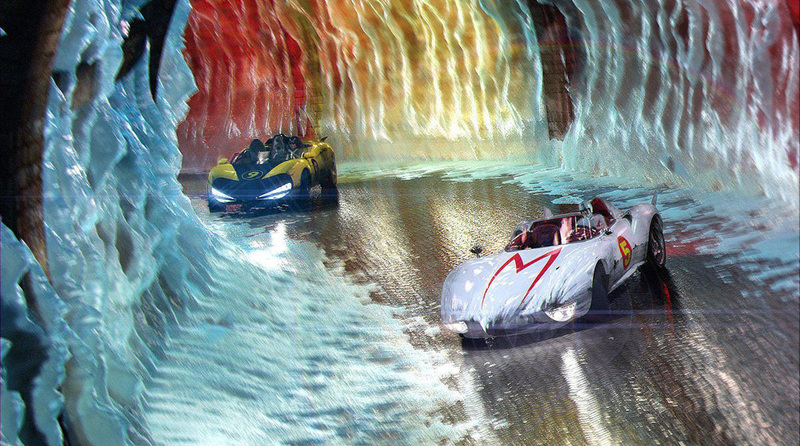 Warner Bros. optioned the rights to Speed Racer in 1992. It wasn’t until 2006, when the Wachowski siblings took the helm, did production start. The movie, also called Speed Racer, begins with Speed (played by Emile Hirsch) preparing for a race, then heading into a flashback of his much younger self in grade school losing focus from the Scantron test in favour of his brother Rex’s upcoming race. The young Speed (Nicholas Elia) then dashes out of class at the bell to meet Rex and convinces him to take him to the track. While trying to figure out what to do next, Taejo’s sister Horuko (Yu Nan) arrives to speak with Speed. She gives him Taejo’s invitation to the Grand Prix; the chit is a guaranteed place in the race for the bearer. With the invitation in hand, Speed and his family get the Mach 6 prepared in record time. Beyond just the visual style, the Wachowskis put effort into recreating the look and feel of the anime. The cast reflects the original appearance of the characters. Emile Hirsch has Speed’s pompadour. John Goodman looks like Pops Racer, and Christina Ricci looks like trixie. The Mach 5 is exactly the way it is shown in the anime. Of special note, Paulie Litt as Spritle not only looks the part, but manages to take a potentially annoying role and make the character fun to watch while acting next to a chimpanzee. The costumes also reflect what the characters wore in the original series, with the exception of Racer X. The Harbinger of Boom’s costume is black instead of white, reflecting Racer X’s work from the shadows of the racing world. Adding to the look of the film is the soundtrack, which uses the original theme as a motif throughout the movie. Added touches include Speed posing in front of the Mach 5 just like in the original opening credits and the use of the original sounds effects of the Mach 5’s jacks. The above is just surface, though. The Wachowskis also pulled ideas from the anime. The Casa Cristo 5000 race can be found in the first episode of the anime, not by name but by setting. Snake Oiler also appeared in the series as the second head of the Car Acrobats, a team that clashed with Speed. Pops’ wrestling also appeared in the anime. The Racer X background is much like it is in the original, with the difference being that Rex is presumed dead instead of missing. The plot would fit in with the series and takes its cues from the original.